Some heroes protect cities; some countries, some worlds. But who’s looking out for the entire universe? One band of heroes has left their lives and the worlds of their births behind, each for their own reason, and has shouldered the weight of all possible universes. A new era has begun for the Exiles; with a new team, and a new mandate, to safeguard the fate and future of the Omniverse. The team also has a new leader, new members, with new worlds, and new adversaries. Now, alternate versions of Sabertooth, Mistiq, Rogue, Psylocke, Cat, Sage, and Morph answer the call. X-Man scribe Chris Claremont and artist Tom Grummet bring you the continuing adventures of the band of time displaced heroes who have come together to defend the Omniverse from any and all threats. Beginning a new era for the Exiles — with a new team, and a new mandate, to safeguard the fate and future of the Omniverse. New leader, new members, new worlds, new adversaries. They’ve barely begun to get to know one another when they’re thrust into their first mission — summoned to a world where the dawn of the historic Marvel Age turns out instead to be a prelude to global catastrophe. Meanwhile, back at the Crystal Palace, Sage struggles with a psychic curse that may well make her the new team’s greatest liability. The story begins in a dimension where 30 years ago we find 4 astronauts embarking on a mission into space. These astronauts; Reed Richards, Ben Grimm, Susan Storm, and her brother Johnny, take off into space and run into a radiation storm that causes the foursome to end their original mission, as they are bathed in the radiation. Upon reentry, a massive meteor storm strikes the ship causing it to break apart killing Reed, Ben, and Johnny, and plummets into the ocean.. Susan, who has been changed by the radiation, is able to use powers that she has gained to enclose herself in an invisible helmet, and before passing out, is rescued by a strange dark figure, who whisks her to safety underwater. The meteor storm is so destructive that as the meteors crash into the planet, they destroy whole continents and change the face of the planet. Now, the world is dominated by dark-skinned inhabitants, with the African Continent receiving the least amount of damage, while Japan, England, Central America and Brazil, and Cuba totally annihilated. Two-thirds of the world’s population was wiped out. Back to the present day, the Exiles are getting to know each other, and are familiarizing themselves with their base of operations, known as the Chrystal Palace, which sits at the nexus of time and space, and where every dimension and alternate earths can be reached. The team gets a new mission, which takes them to the meteor scarred earth, but gives them little information to go on. Sabertooth dispatches himself, Mistiq, Rogue, Psylocke to the planets aid. Upon arrival, before they can get their bearings, they are attacked, and Rogue is separated from the group. 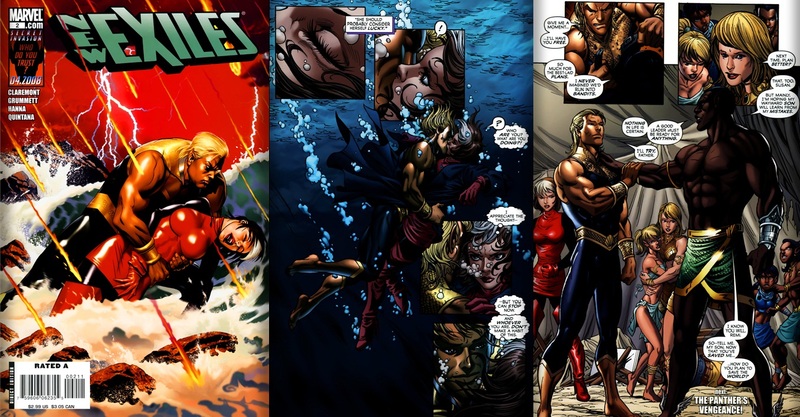 New Exiles #2 – Flight of the Avenging Son! The Exiles have barely arrived in a new dimension before they’re struck by disaster! Sabretooth, Psylocke and Mystiq find themselves in the middle of a long-running conflict between the two most powerful figures on the African Continent, the Black Panther and Ororo. As for Rogue, her fate ends up in the hands of a young man who calls himself Gambit — but if you think that tells you what to expect from this character and this story, try again! He needs Rogue to help him save his parents — Oh, and did we mention he breathes water? 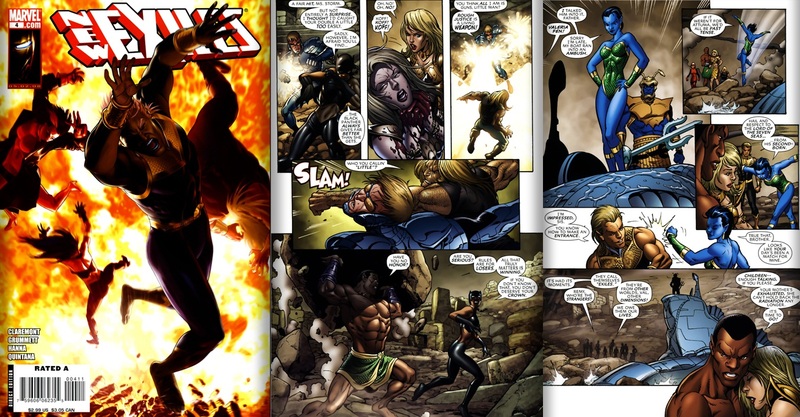 The Exiles team is attacked by a group of super humans called the Panther’s Bloodforce. During the attack, Sabertooth is bitten and taken control by the member called BloodWitch, and is made to attack Psylocke. Suddenly there is a big flash of lighting in the sky, and the Exiles are whisked away. Meanwhile, Rogue, who was thrown off the cliff where she was standing by the initial energy blast, is rescued by a strange young man who can breathe underwater the young man revives Rouge, and both go back up to the surface. The young man introduces himself as Remy, also called Gambit. Gambit describes for Rogue the events from 50 years prior that turned the planet into what it is today. Remy suggest to Rogue that her friends were probably taken in by “Queen Ororo” who is one of the two most powerful people on the planet; the other person being the Black Panther. The two sides are at odds, and the Atlateans, which Remy not only belongs too, but whose father, Namor, is currently the ruler. Remy explains that his family is in trouble, and Rogue agrees to go with him to help. Meanwhile Sabertooth and Psylocke have indeed been rescued by Queen Ororo’s faction, and brought to safety at her base of operations, located in Alexandria, Va. They arrive during a meeting with Queen Ororo and Kang, who hints at Namor not being in place, but warning her to mind her own business. Gambit and Rogue find Gambit’s family, and rescues them from their captives. New Exiles #3 – The Panther’s Vengeance! On an Earth ravaged almost a half-century ago by a brutal storm of meteors, the first mission of the New Exiles has turned into a madcap exercise in survival against increasingly deadly adversaries. In the heart of the Central African desert, Rogue learns the identity of Gambit’s parents and the truth about his origin. At the same time, Sabretooth and Psylocke try to deal with the apparent loss of Mystiq while preparing to embark on a search and rescue mission to recover Rogue, unaware that they’ve already been caught up in an enemy’s cunning and deadly web. Instead of a rescue, this new team of Exiles may be heading straight for disaster. Remy introduces Rogue to his family; Namor, his mother, Susan (Storm) McKenzie, his younger sister Ari, and the twins, Johnny and Erin. After brief salutations, Sue uses her force field powers to make a plane to carry her and her family, with Rogue flying them. Their plan is to go to the Queen’s palace to see if Rogue’s friends are there. Meanwhile at the palace, Psylocke and Sabertooth are introduced to this earth’s version of Cat; called Shadow Cat. Sabertooth, who is still under the influence of Bloodwitch, kisses Psylocke, which gives BloodWitch the opportunity to take her over. Rogue, Gambit, and the rest of the family arrive at a secret hideout, and are soon met by Sabertooth, Psylocke, and ShadowCat. Sabertooth and Psylocke, still under BloodWitch’s influence, attacks Namor, Gambit, Rogue and Sue, and the Bloodforce, along with two more members appear. Sabertooth and Psylocke finally are able to bust free of BloodWitch’s control, and in turn, attacks the members of Bloodforce. The group led by Sabertooth starts to gain an advantage, when the Black Panther shows herself, and takes Sue hostage. New Exiles #4 – New Life, New GAMBIT! Double the alternate reality action this month as two issues of New Exiles bring us two tales from two different universes! In this issue, Sabretooth, Psylocke, Rogue, and new ally Gambit are caught in the middle of a war between the Atlanteans, Queen Ororo, and the Black Panther. Plus, whatever happened to Mystiq? Find out in the conclusion to the series’ first arc! Reality-hopping action as only the New Exiles can deliver! The Black Panther has Sue in her clutches. This Panther rose to power by killing T’Challa in the aftermath of the meteor storm. As she gloats, she is then sucker punched by Sue, who it is revealed to be Mistiq in disguise! Namor then goes on the offensive, and the battle began anew. As the Exiles and the McKenzie family start to gain an advantage, the Black Panther has her team teleported to the entrance of the cave in which they were battling, and in their place left a nuclear device. The device explodes as the Panther and her crew escaped by jet. Gambit and Sue use their force field powers to shield them from the force of the explosion and the resulting radiation. They were on the verge of exhaustion when Namor and Sue’s oldest daughter, Fen, arrived in an Atlantian submarine, which took them to safety. The Black Panther sets off planetary devices which engulf the planet in a force barrier. The Exiles and Gambit and his family barely escape, to a space station they have. The Exiles get the call to return home, and Gambit asks his father if he could return with them. 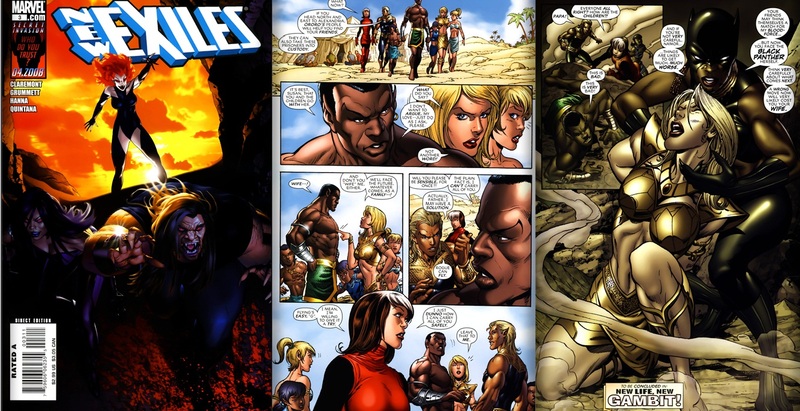 Namor gives his consent, and the Exiles return. Upon return, they find out that their mission was not to save the planet, but to get their last member; Gambit. Cover- Every cover was hot honestly. They had this “somewhere between” a painting and standard comic book feel that really clicked for me. Story– For all who like the time jumping, alternate earth visiting, different dimension with alternate versions of yourself stories, this is right up your alley! 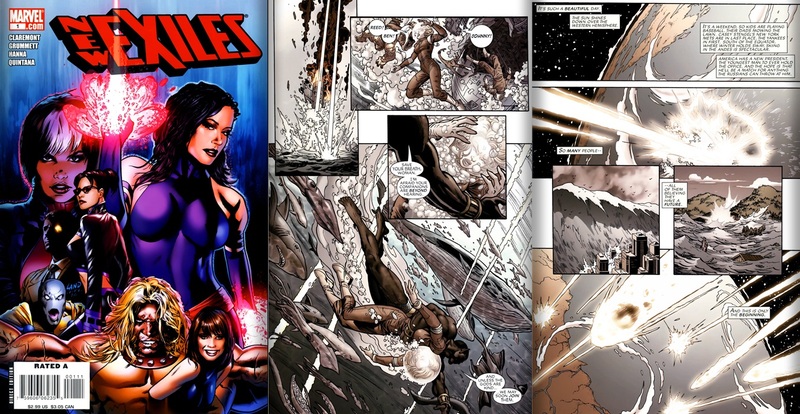 The Exiles are a group of mutants who have been displaced from the earth of their origin, to help protect the universe as a whole. This is a big responsibility, but the team is up to the challenge. They may encounter versions of people they know, who may look exactly like the people they know, there will be some type of difference which will differentiate them. In the case of Mystique, the one we are familiar with is the blue skinned villainess, but the Mistiq we see here is a white male, and is one of the good guys. Same thing with Sabertooth; not the savage berserker we are used to seeing, but a level headed, intelligent, even sensitive leader. Originality- I was very impressed by this alternate timeline. Usually we get the drab and mundane “oh this person has conquered earth” type stories. This one opened with the near extinction of life on earth (typical fair) but branches off by for once having Africa be the premier superpower of the timeline. I honestly think this simple premise could sell a mini series or two by simply exploring what a world with a predominately black population would be like. Black Heroes- We got King Namor and his kids Erin (daughter), Ari (daughter), Johnny(son), Valeria Fen (daughter), Gambit ( Son) along with Villain Black Panther. That right there is the most we’ve had in a single sitting in awhile. New Exiles- As a team I never much liked this iteration but this opening arc was well crafted and served to introduce us to Gambit in a great big splashy way making him seem very important to the stories that would follow. Art-Tom Grumett does an excellent job on art complimented by Scott Hanna’s inks and the dynamic and vibrant colors of Will Quintana. Story- Simply put; there is too much going on. Not only do you have the main plot, but it seems like almost everyone on the team has drama going on with them, and at times it takes away from the story. The situations they face solving the Omniverse’s problems should be harrowing enough. And then there’s Morph. What the hell is he? Wolverine and Storm- seriously! America is obliterated along with most of Europe and Asia and Claremont still manages to put Storm and Wolverine together? (Shakes head) That’s so played out at this point I could just cringe!